Starting out on your WordPress site you may have made a few posts or pages to learn the ropes and wish to modify their category to fit with how your content flows currently. You could also be looking to make a post into its own page or a page into a post. In this article I will show you how to do some of these simple site cleanup tasks. I will start by making sure the posts I want to edit are posts and the pages I want to edit are pages or change that as needed. To do this I will install and activate the Post Type Switcher plugin. This plugin will allow me to change a post or a page with very little effort. With the Post Type Switcher plugin active I will go to the All Posts page and use the quick edit option on what I wish to change. This will also work on the All Pages page and inside the object you are editing directly inside the Publish box. 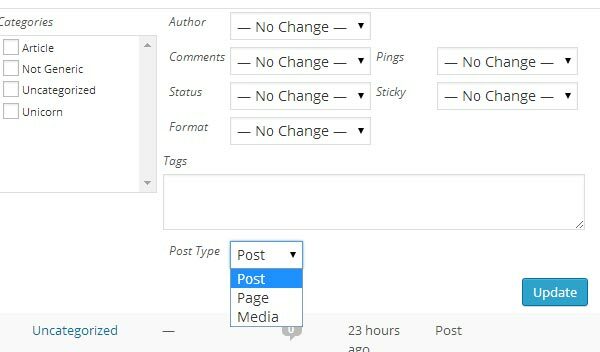 This plugin is also able to edit multiple posts or pages using the WordPress bulk actions. To do so you will need to go to All Posts and check the box next to the ones you wish to edit. Then find the drop-down menu at the top or bottom of the list and change it to Edit and press Apply. This will show you the chosen posts in quick edit mode and allow you to change multiple things including if it is a page or post. While Post Type Switcher is a very simple solution for changing, there are times where you may need a more powerful way to modify posts. In these situations we will want to use the Convert Post Types plugin. After this plugin has been installed and activated you will have a new menu item under tools called “Convert Post Types”. 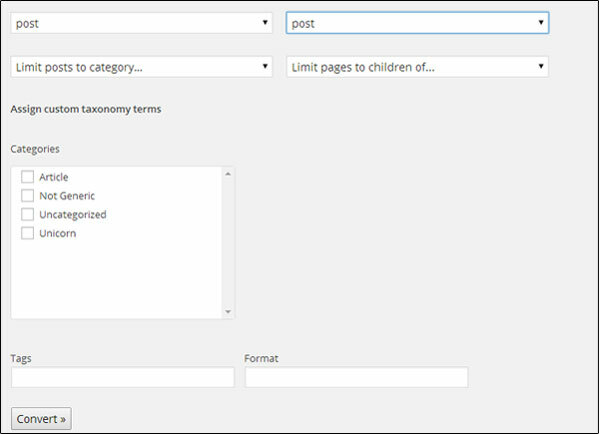 This plugin is quite powerful as it will let you select a piece of content by category or parent page and assign it a category, tag, and format. I hope this article helps you with some website housecleaning and ensuring that your content flows how you want it to.